Our view of the trading of enslaved people needs a different perspective. Rachel Engmann, assistant professor of African studies at Hampshire College, discusses why African experiences need to be brought to the fore. 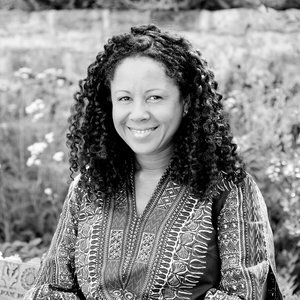 Rachel Ama Asaa Engmann, assistant professor of African Studies, received a B.A. in anthropology from Columbia University, an M.A. in museum studies from Columbia, an M.A. in heritage from Stanford University and a Ph.D. in archaeology from Stanford University. She also completed a postdoctoral fellowship from Brown University. Engmann teaches courses on historical and contemporary forms of the African experience, such as African Islam, critical heritage, material culture, museums, Islamic archaeology, slave trade, slavery, and colonial photography. A scholar who applies a multiple lines of evidence approach (objects, texts, oral narratives, and ethnography), she enjoys working with students interested in engaging with a variety of documentary sources, and combining different theoretical and methodological approaches in the humanities and social sciences, in search of novel revisionist historical and contemporary approaches to the study of Africa. As a scholar/practitioner, Engmann has two research projects in Ghana. The first project, Hidden Palimpsests: Unraveling Nineteenth Century Islamic Talismans in Asante chronicles the relationship between objects, texts, religion, and empire. She examines some of the oldest and most extensive sources in existence from museum, private, community, and royal collections. Her second project, Slavers in the Family: The Archaeology of the Slaver in Eighteenth Century Gold Coast, is a study of Christiansborg Castle, a UNESCO World Heritage Site, former seventeenth century European trading post, Danish and British colonial seat of government administration, and Office of the President of the Republic of Ghana. She is the first scholar granted access to the site. It is the first excavation of the Castle. This community archaeology, ethnography, documentary film, and museum project is grounded in its commitment to the political impacts of research on direct descendants and the public. As a Ghanaian descendant of Carl Gustav Engmann (1752-1757), a Danish Governor at Christiansborg Castle and Board Director of the Danish Slave Trade Organization (1766-1769), she has coined the term “autoarchaeology.” This project contributes to the Ghana Government’s aims to convert the site into a museum. Further information can be found in at http://christiansborgarchaeologicalheritageproject.org (English, Ga, and Twi). Archaeological excavations at Christiansborg Castle in Ghana challenge traditional historical interpretations of the Danish transatlantic slave trade based on European colonial written accounts. Such sources present history from a European – often white, male, elitist – colonial perspective, frequently marginalizing or disregarding African and Afro-European experiences. Christiansborg Castle, a UNESCO World Heritage Site, is a former C17th European trading post, Danish and British colonial seat of government, and Office of the President of Ghana. Between 1694 and 1803, 100,000 enslaved Africans were transported from the castle to the Danish West Indies. I am a Ghanaian archaeologist and direct descendant of Carl Gustav Engmann, a Governor at the castle and Board Member of the Danish Guinea Company, and Ashiokai, the Osu Chief’s daughter. At the castle, we adopt a collaborative approach to archaeology. Our team includes descendants whose ancestors lived close to the castle during the 18th century, and who continue to do so today. Historical archaeology at the Castle adopts a multiple lines of evidence approach, employing artifacts, texts, oral narratives and ethnography. This is in keeping with the notion that there are multiple, competing readings of the past, creating a dialogue between different understandings of the African, European and Afro-European experience. To date, fieldwork has unearthed a pre-colonial settlement. We have also excavated a cannon, African trade beads, Chinese and European ceramics, African and European smoking pipes, local pottery, European glassware and many other small finds. We also discovered an underground tunnel from a slave trader’s house that debouched within the castle. Together, we are rewriting histories once marginalized, silenced and erased. We are shedding light on little known episodes in the history and legacies of the transatlantic slave trade.